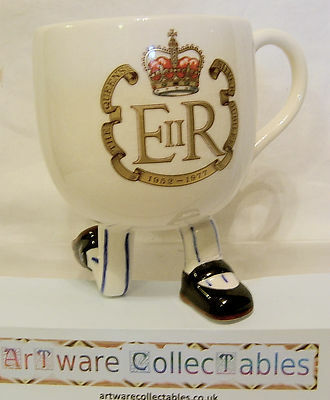 This is one of a series of 'Royal' releases from Carlton Ware in their 'Walking Ware' series produced in the 1970s. This one commemorates the Silver Jubilee of Queen Elizabeth II 1952-1977. On the front is the official emblem issued at the time. Designed by Roger Michell (Lustre Pottery) for Carlton Ware, this particular set is highly collectable as it is now becoming harder to find. The overall height of the Cup is 5.25 inches (13.5 cms). The Cup is in excellent condition though, as is often the case, does have some overall crazing. It is appropriately backstamped under the bowl of the cup.